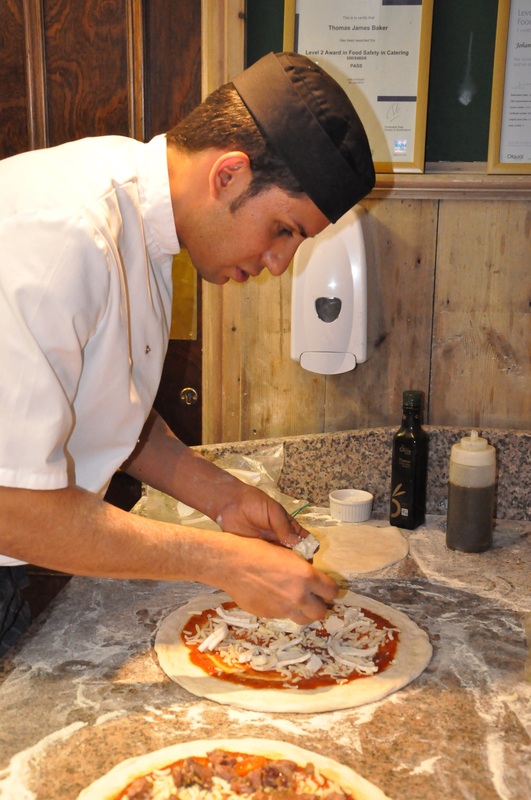 Amidst the quaint lanes of historic York, a little slice of Italy is being rustled up and attracting crowds from far and wide. 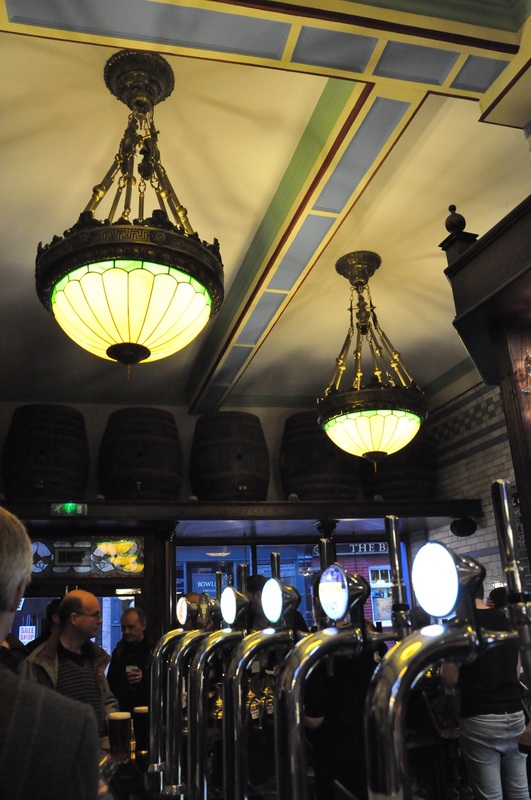 Nestled on the Fossgate, part of the growing chain of The Hop pubs from the award-winning Ossett Brewery, their newest pub in York follows the trend of stylish and innovative décor which blends beautifully with a traditional feel and top quality real ales. But the real jewel in the crown is the small pizza kitchen, situated at the back of the building. 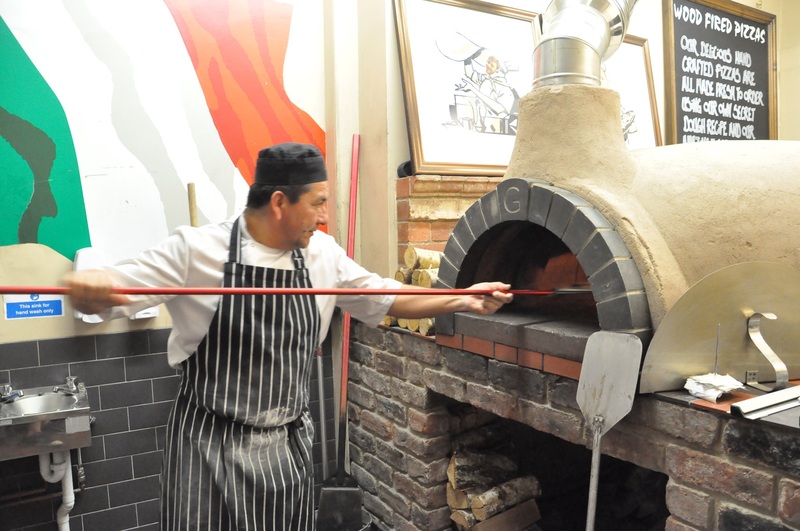 Working with an authentic wood fired pizza oven, which climbs to around 360 degrees and cooks the pizzas to perfection in around 4 minutes, the dedicated chefs buzz around the kitchen and produce, on average 120 pizzas per day, rising to over 200 on a weekend. After a long, hard week at work, Miss Tale of Two Sittings and I ventured into the bustling pub in search of a tasty slice and it exceeded our expectations on every account. 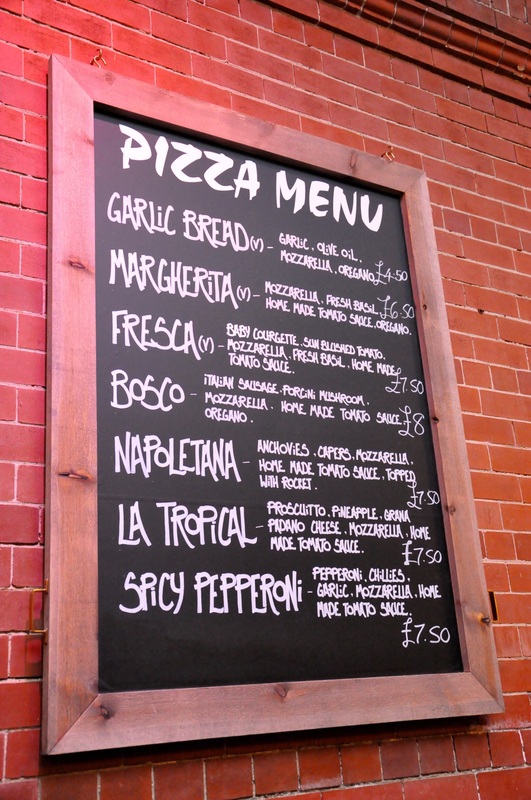 The kitchen offers a small but varied menu of 8 pizzas, along with a monthly special (at the moment it’s a spicy Jamaican Jerk chicken with a fruity salsa topping). Head Chef Johan showed us around the kitchen (we did a great job of quickly getting in the way) and told us about the process he undergoes when making the dough. 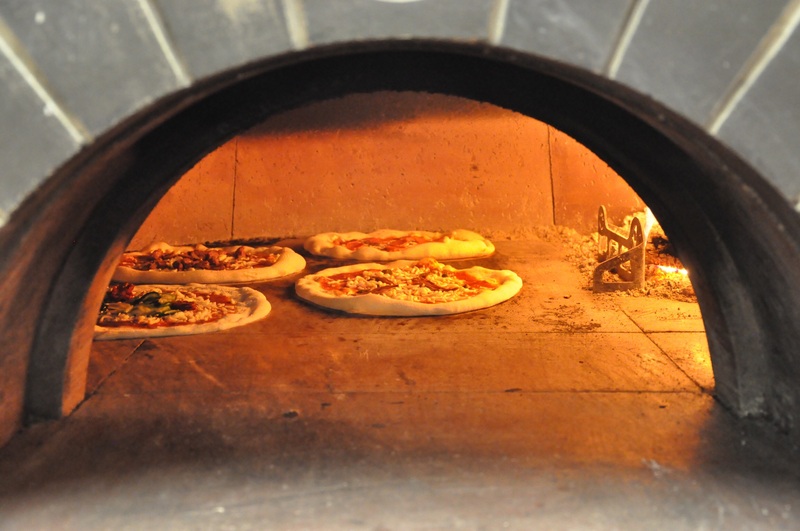 It seems like authenticity and quality are the order of the day here, as unlike most outlets who make and cook the pizza dough on the same day, the kitchen at the Hop prides itself on using Italian methods, using a three day retarded dough which provides a perfect elasticity in order to produce the almost paper thin base. 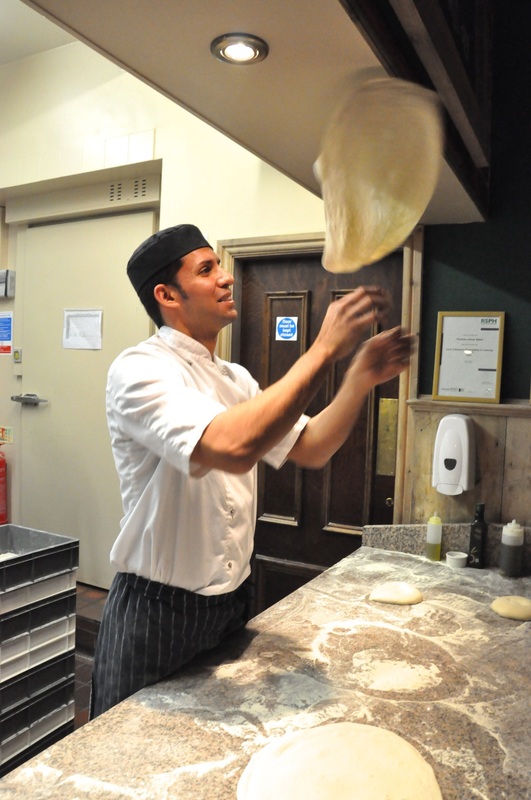 Watching him shape and throw the dough around was like watching aerial gymnastics, and we couldn’t actually believe how thin the base became – you could probably read a paper through it, but we were too ravenous to put this theory to the test. Now I am well known as being a pizza-hater, so this was a real experiment in whether I could change my culinary tastes and enjoy a dish I’d normally avoid on a menu. Normally I think that pizza is stodgy, cloying and altogether rather uninspiring, but I have to admit, this wasn’t any ordinary pizza. Choosing the Valentina and the Bosco, we sat at our table and in the blink of an eye were served two large plates of bubbling hot pizza. 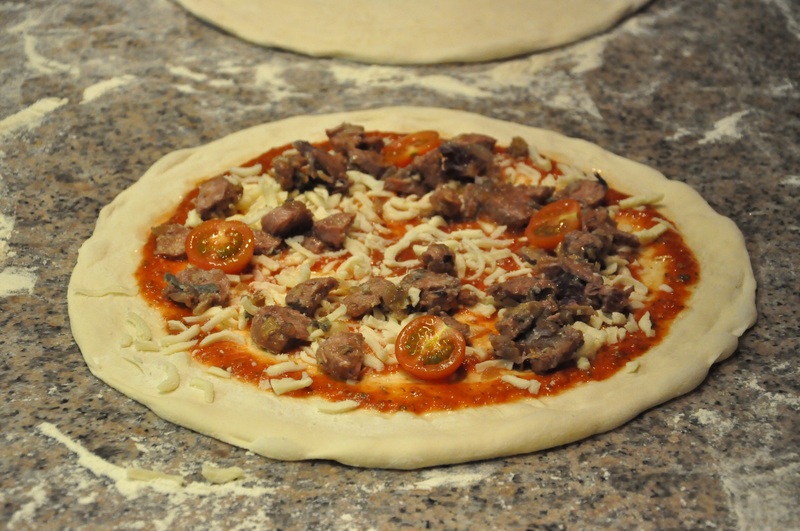 Having already peeked at the ingredients, either sourced locally or imported from Italy, it was the fresh taste that really made the difference and set this pizza apart from any I’d begrudgingly tried before. 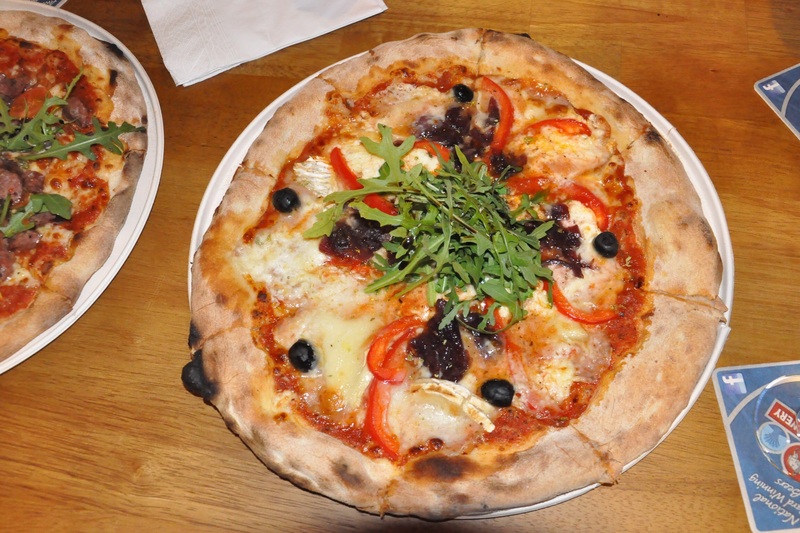 The Valentina boasted a generous topping of goats cheese, caramelised onions, black olives, red bell peppers, rocket and a drizzling of balsamic vinegar. The mild, creamy goat cheese worked brilliantly with the sweet onions and the piquant peppers. 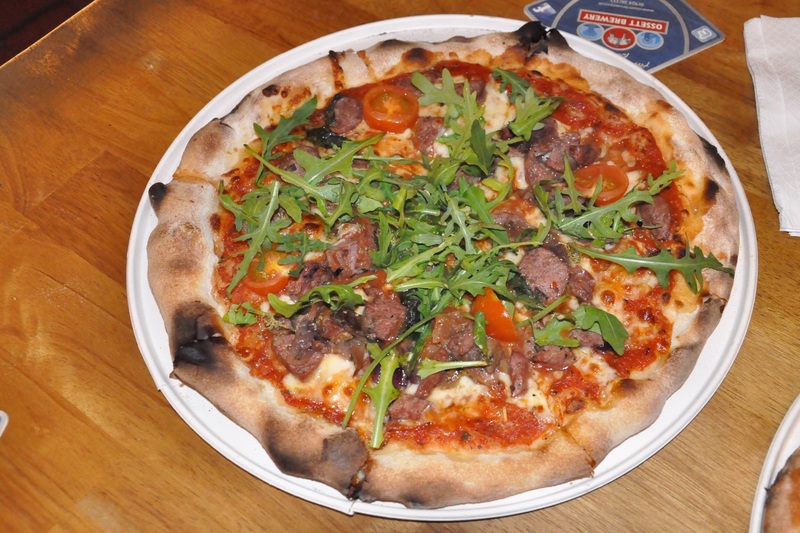 The rocket is added at the end, after cooking, giving it a fresh, peppery kick and the thing, bubbled up thin base is crispy, nutty and possibly the reason why these pizzas are selling out every day. 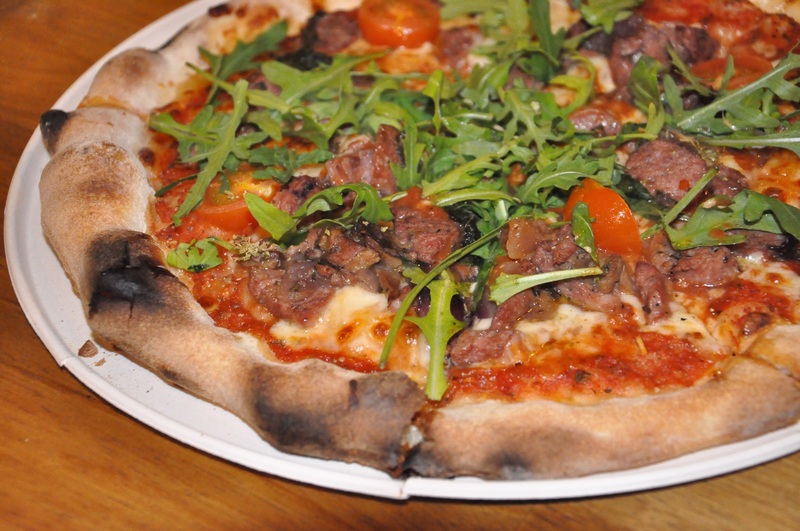 The Bosco was a carnivore’s dream, with large chunks of Italian sausage, marinated in red wine, rosemary and thyme added on with red onion, mozzarella, porcini mushrooms and fresh cherry tomatoes, with a handful of rocket after it comes out of the oven. This was just as flavoursome as the Valentina, with the herbs and meat making each mouthful filling and moreish, The seasoning was perfect and the topping was so generous that you definitely felt full and satisfied, even though we still kept on picking at the rogue pieces of topping that had slid off the slices after we had greedily devoured them. 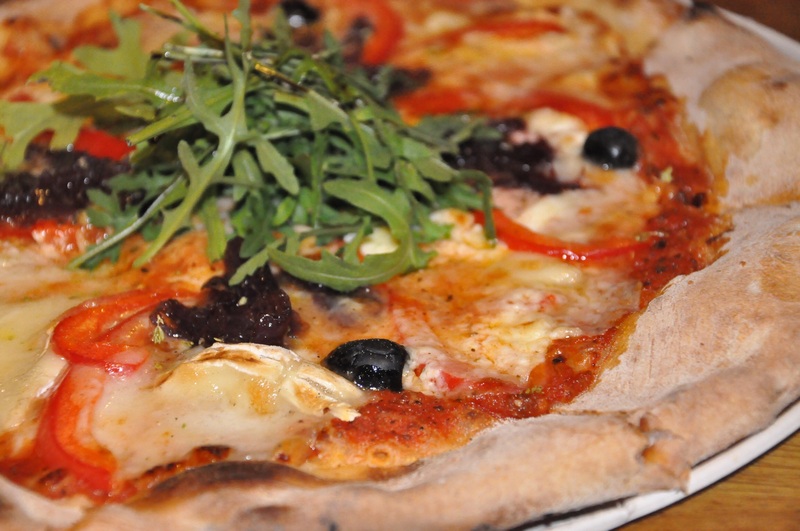 This once seasoned Pizza hater had been coverted – in fact, I’m hooked. 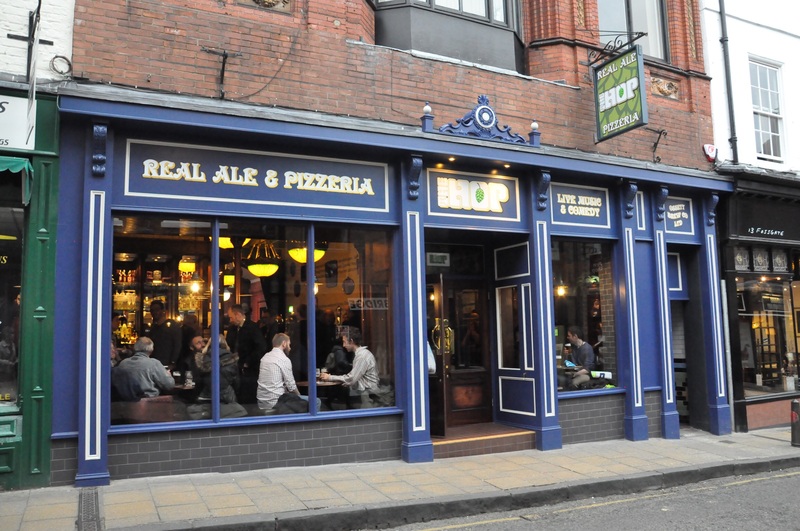 If it’s tasty, Italian style pizza you’re looking for, impressive listed building surroundings and award winning ale, then look no further than The Hop in York. I think it’s safe to say The Hop is recommended! 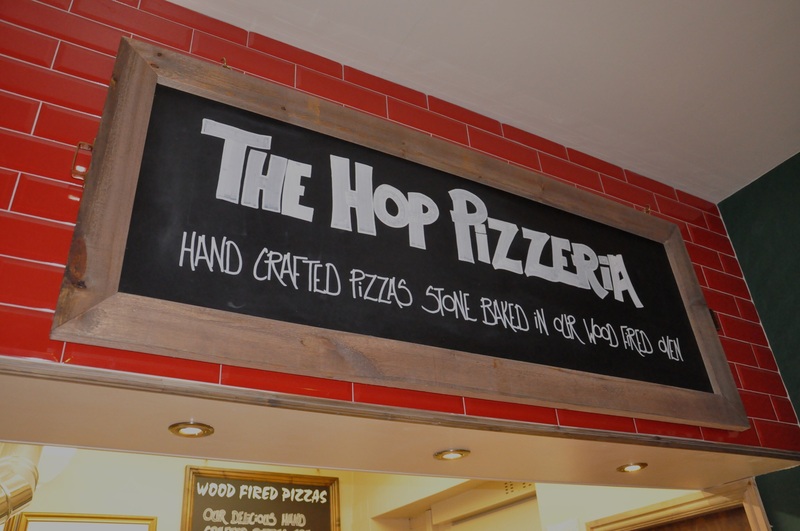 Disclaimer: we were invited to try the pizzas at The Hop, so our food was complimentary. The views expressed are as always 100% honest and unbiased.